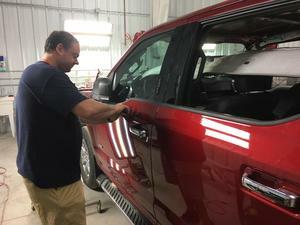 2016 Aluminum Ford Paintless Dent Removal. Lots of people ask can you repair the new Aluminum Trucks ? The answer is yes we have you covered , here is one of our veteran technitians Matt fixing hail damage to the Brand New 2016 Ford F-150 all aluminum 1/2 ton crew cab. Please dont just let someone tell you they can fix it let us prove it !